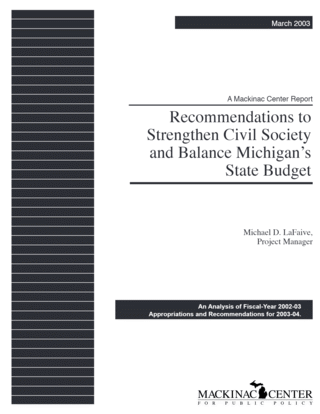 The Michigan state budget contains 20 separate line items under Section 110 (“Fairs and Expositions”) in the MDA budget, denoting exactly where this $20 million is spent. Expenditures in this area include money to state fair operations, prize money for fair contests, and “purses” for horse racing victories. Section 110 should be eliminated from the state budget entirely. The following is a list and description of each line item. Michigan State Fair: The official fair of the state of Michigan was the first of its kind in the nation. It was originally held in a different city each year, but since 1905, has been located at the corner of Eight Mile and Woodward in Detroit. Its 2003 appropriation is $5,110,200. Most of the revenue for the state fair is generated by ticket sales, but that has not always been the case. From 1970 to 1995, for example, the fair lost an average of $2 million annually, which the Legislature ultimately subsidized with additional appropriations. From 1995 to 2002, fair attendance and revenue improved, but not by much. In 2002, the fair eked out a $28,000 profit. This is not a cause for celebration, however. Due to the collapse of a lease arrangement between the state, fair officials, and a private developer, the cost of maintaining the fairgrounds will increase by about $900,000 in 2003, excluding necessary capital improvement costs. The state should remove itself from fair operations entirely and sell the 200 acres of state land on which it operates. What revenue might the sale of state fairgrounds generate? It is impossible to tell precisely without actually selling the land. Still, a general idea of possible sales prices can be formed by extrapolating data from the offers made on properties adjacent to the fairgrounds. In April 2000, developer Joseph Nederlander agreed to purchase 36 acres of government-owned land adjacent to the state fairgrounds in Detroit for $6.1 million. Before the deal was legally finalized, Nederlander sold it to another developer, Bernie Schrott, for $10.5 million. While both of these deals ultimately fell through, they still give an indication of what the 36 acres might sell for. What if the parcel for sale was 5.5 times larger, as is the fairgrounds? The potential for $57 million in one-time revenue makes the sale of the fair land and its buildings worth exploring. Savings: $5,110,200. Upper Peninsula State Fair: The Upper Peninsula (U.P.) State Fair, located in Escanaba, was not created by the Legislature until 1927. Its 2003 appropriation is $1,214,400. During the last fiscal year it required a General Fund/General Purpose subsidy of $177,900 in fiscal year 2001 to pay its bills. The state of Michigan should remove itself from U.P. state fair activities entirely, and the 100 acres of state-owned land on which this fair operates should be sold. That’s because, as with other forms of private entertainment, state fairs should sink or swim on their own merit. If there is demand for these summer festivals, the people who value them the most will be willing to fund and operate them without state influence. Even if the state were to remove itself from fair involvement, it would hardly result in a dearth of fair fun. Seven Michigan counties and another 80 communities and associations run their own fairs, too. Ottawa County alone has three different community fairs. Barry County’s Bill Ackerman has run a private, for-profit fair for 24 years. The “Prairieville Old Fashioned Farm Days Show Grounds” plays host to fair events every August. Animals are on display for show and racing; there are craft shows, dancing, live country music, cow-chip golf ball driving contests, and a “National Truck Pull” competition. It is situated on 140 acres of land owned by Ackerman. His fair is so popular it often fills the 3,000-space camping area set aside by Ackerman for overnight guests. The sale of the U.P. land would generate dramatically less revenue than the state fairgrounds in Detroit, given the abundant supply of undeveloped land in and around Escanaba. According to Kevin Dubord, assistant assessor for the city of Escanaba, land adjacent to the fair sold two years ago to Gordon Foods Inc. for $2,000 per lineal foot of street frontage. That is, it cost $2,000 for every one of the 250 feet of land available along North Lincoln Road, on which the Gordon Foods property, and the fair, are located. At $2,000 per lineal foot, the UP fairgrounds might fetch $2,600,000. Savings: $1,214,400. Other Line Items under Fairs and Expositions: In early 2002, Gov. Engler used his veto pen to remove most of the following expenditures from the state budget because of a disagreement over the sizes and source of the appropriations. On Sept. 17, 2002, he asked the Legislature to reinstate the funding at the levels he originally requested. After some haggling, the funding was reinstated. Fairs and Racing: This line item funds five full-time state employees to “oversee” other fairs, particularly with respect to how state “premiums” are used (see “Premiums — County and State Fairs,” below). It also provides assistance to county and community fairs. According to MDA Horse Racing Analyst Bob Woodman, state employees advise fairs on how to maintain records and help them “keep business.” They also administer “Michigan Bred” programs that are funded for pari-mutuel breeding programs (see “Standardbred Sire Stakes” and “Standardbred Breeders’ Awards,” below, for more information). The Michigan Bred program is sold as a way to improve Michigan horse racing by helping to subsidize Michigan “winners.” The truth is that it may actually harm Michigan’s racing industry by excluding superior racing bloodlines from outside Michigan borders. It is not illegal to breed a Michigan horse with one from Kentucky, but doing so may exclude the owners of champion horses from collecting larger purses. Savings: $612,500. Building and Track Improvement - County and State Fairs: This is a line item to help improve the racing tracks or buildings and grounds at Michigan fairgrounds. Savings: $963,200. Premiums — County and State Fairs: “Premiums” are generally used as award monies to children who win prizes for such things as raising the best livestock, having the best crafts, or winning the “antique tractor pull” contest, to name just a few examples. Savings: $1,614,000. Purses and Supplements - Fairs and Licensed Tracks: According to Michigan Deputy Racing Commissioner James Bowes, this line item enlarges the potential winnings for horse owners who enter their animals in races around Michigan. This is designed to improve the number and quality of races by providing a greater incentive for horse owners to run their animals at Michigan racetracks. Savings: $2,969,000. Standardbred Fedele Fauri Futurity: This line item reflects money that is appropriated to subsidize a particular race, known as the “Fedele Fauri Futurity,” at just one fair, the Kinross Fair in the Upper Peninsula, just outside of Sault Ste. Marie. Savings: $98,400. Standardbred Michigan Futurity: This line item is also appropriated to subsidize a specific “harness” race, which was held at Mecosta County Fair in Big Rapids in 2002. Harness racing involves jockeys being pulled by horses on two-wheel carts. Savings: $98,400. Quarterhorse Programs: A “Quarterhorse” is a specific breed that is raced in Michigan in “flat back” style (that is, without a harness and carriage to pull). The appropriation is used to subsidize the award for winners. Savings: $48,300. Quarterhorse Programs Breeders’ Awards: Breeders’ awards are granted to Michigan owners of horses whose offspring go on to win a race in Michigan. Savings: $5,000. Licensed Tracks - Light Horse Racing: This program supplements winning purses for the owners of horses that are four years old. It is essentially an age-specific category. Savings: $93,500. Standardbred Breeders’ Awards: Breeders’ awards are granted to Michigan owners of horses whose offspring go on to win a race in Michigan. Savings: $1,503,200. Standardbred Purses and Supplements - Licensed Tracks: The state adds supplements to winning purses to increase the incentive for Michigan standardbred owners to enter their horses and compete. This line item is similar to the purses and supplements for fairs and licensed tracks, listed above. Savings: $336,700. Standardbred Sire Stakes: This appropriation subsidizes the purse of a race run annually and by a specific breed of horse that is also sired in Michigan. The finals have been held at Hazel Park Raceway the last two years. Savings: $1,259,400. Thoroughbred Sire Stakes: This is a specific race at Great Lakes Downs in Muskegon run by a specific breed of horse that is also sired in Michigan. Savings: $1,259,400. Standardbred Training and Stabling: This line subsidizes fairgrounds that provide stables and training tracks for standardbred horses. Savings: $53,200. Thoroughbred Program: This is a fairly sweeping program that encompasses various purses and awards for owners of Michigan bred horses. Savings: $2,203,900. Thoroughbred owners’ awards: This program supplements winning purses for horse owners whose thoroughbreds are Michigan bred and obtain a certain amount of points based on their year-long racing performance. Savings: $189,600. Distribution of Outstanding Winning Tickets: Every year a percentage of winning tickets from horse bets goes uncollected. Money that would have been collected is now divided between the owners of racing tracks and the owners of the horses involved in each race. Rather than appearing under “Fairs and Expositions” in the MDA budget, this appropriation could accrue to, and be distributed by, the Michigan Gaming Office. Transfer: $500,000.